Perfectly thick, soft and chewy peanut butter bars topped with melted chocolate chips, butterscotch chips and peanut butter. 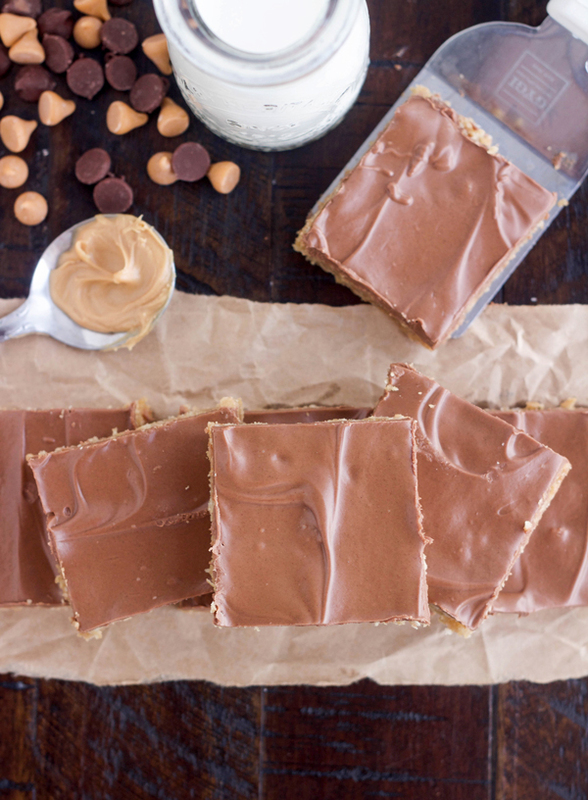 These Glazed Peanut Butter Bars are going to become a family favorite. You guys, I did it! This past Saturday night, I finally stepped foot into a Red Robin Restaurant after 25 years, it’s really kind of a miracle. Let me explain. . . . I was 8-months pregnant with my oldest son the last time I ate at a Red Robin. The morning after we ate there, my husband and I both woke up sick to our stomachs. It wasn’t fun or pretty, but we were both feeling better by the end of the day. We chalked it up to something we ate at Red Robin and decided it would be a while before we ever went back. Well almost a week later I started getting this weird taste in my mouth where everything I ate had a metal taste to it. A couple days later I woke up with the left side of my face paralyzed. It pretty much freaked me out and I immediately called my OB. He saw me that day and told me I had bells palsy. He made an appointment for me with a doctor that could hopefully help. The doctor said bells palsy is usually caused by two things; a virus or a traumatic experience. When it’s caused by a virus, he said that you get a “metal” taste in your mouth a few days before it happens. I told him that’s exactly what happened to me. To make a long story short, it lasted for several months and I hated every minute of it. My eye wouldn’t close on its own and I couldn’t drink from a glass without spilling it all over so I had to use a straw. I was embarrassed and so self-conscious. I delivered my son a few weeks after getting it and didn’t even want anyone to take pictures of me holding him because I couldn’t smile. Well, I could smile, but only half of my mouth did and I looked ridiculous! So I blamed the virus I got that caused the bells palsy from eating at Red Robin. I really have no idea if that’s where I got it, but because of the timing of it all, in my head it was Red Robin’s fault and I was never, ever going to eat there again. Looks like 25 years later, I finally over came my fear, haha! Have you guys ever eaten somewhere, gotten sick and vowed you’d never go back? Ok, sorry for the rambling, let’s talk Glazed Peanut Butter Bars now. These bars are absolutely delicious and should be kept under lock and key if you have no self-control. They’re a cross between these peanut butter bars and scotcheroos and you won’t be able to eat just one. Make sure you don’t overbake them, that is key here. You want them to look underbaked in the center when you take them out of the oven. Let them cool just a bit and then carefully spread the chocolate layer on them when they are still warm. Preheat oven to 325°. Spray a 15x10xi-inch jelly roll pan. Spread into a prepared pan. Bake for 16-20 minutes or until they begin to turn golden on the edges (the center will still look under baked, don't over cook!). In a microwave save bowl, melt chips and peanut butter for 1 minute, stir until smooth (if necessary, cook in additional 15 second increments until smooth). Pour over warm bars and spread evenly. Cool completely on a wire rack before cutting. I got heartburn so bad after eating watermelon while I was pregnant with my daughter, I swore would never eat again. After 20 years I finally decided to try it again and thankfully no heartburn. That’s a long time to go without eating watermelon :)! Glad you gave it another try! I thought these would hit the spot while we go through our polar vortex. What could be better than peanut butter and chocolate? These were absolutely delicious! I am glad I had everything in the house to make them. Thanks for another great post! Also, the corn flake cookies I made a few weeks ago were a huge hit with the people after church. I live in Grand Rapids, Michigan. We have had a week of snow, wind and cold. It has been nice to have my husband and boys home all week.